The following is based on a simulation programme developed in 2006 at Imperial College, London by Oliver Ahad under the supervision of Professor JMR Graham and Dr Varnavas Serghides. The simulation project formed the basis for Oliver's dissertation in completion of his Masters Degree in Aeronautical Engineering. The simulator here is a simplified version designed to be used with the X-Plane flight simulation software to be found at www.X-Plane.com . 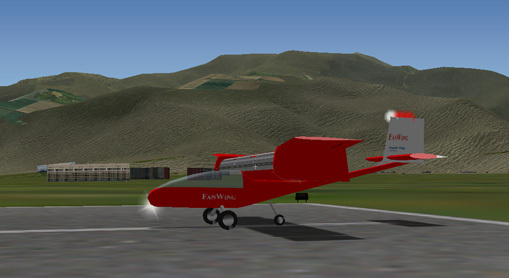 The X-Plane software obviously cannot model the FanWing accurately - the technology is unprecedented and unique. To compensate, a model was created with a combination of vectored thrust engines and airfoils to correct the flight characteristics and, within inevitable limitations of these early stages of a new development, match as closely as possible the known flight characteristics of the FanWing. Note that the simulator was built on data derived from a very early wing design (1997) that was on loan to Imperial College for use by the students. As a result of this the flying model derived is very slow. 1. Move the FanWing folder into your Aircraft Folder. - A joystick with rudder control will simplify turns since there is no auto-coordination between rudder and ailerons in the model. - For accurate loading, go to the settings drop-down menu, and then to Weight and Balance. Set the payload weight to zero, and increase the fuel weight to 88lbs. - To take off, release the brake and bring the throttle up to about 70%. When the forward speed reaches approximately 12 knots, take-off by adding an increment of power, not by increasing the pitch. After take-off, push the nose down to gain some speed, and counteract this by adding a little more power. - Turning: Steep turns should be accompanied with a small increase in power or elevator deflection to avoid loss of height. Be sure to apply rudder during turns to keep the aircraft in balance. - Landing: It is easiest to control your descent on final approach with pitch changes, as these will be smoother and less sensitive than using power. Remember that it is not necessary to flare or bleed off speed, so you can approach at a low pitch angle.